When Meghan Markle stepped into her completed wedding gown she cried tears of joy. In many ways the creation of the gown has been very much in step with Meghan's journey since the engagement. Days after it was announced, the newly-engaged Meghan began meeting with designers and outlined her ideas for a gown that will almost certainly marry her signature style with tradition and earn its place in the history books. 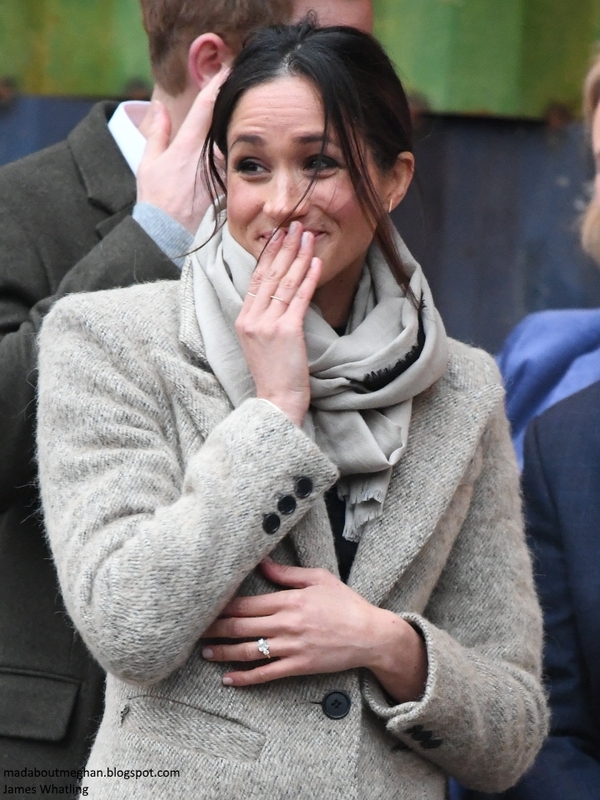 As the details fell into place during a series of meetings and fittings at a secret location throughout the spring, she was busily embracing her new life during a tour of engagements around the UK. Now, the finished piece is safely housed in Windsor Castle, where courtiers have ensured it is kept away from prying eyes. Meghan will see the dress again this week, perhaps for the final time before the wedding. In keeping with tradition, she will join Her Majesty the Queen at Windsor to view it. The enormity of that moment will not be lost on Meghan, nor will the knowledge her life is about to irrevocably change forever. In eight days she will arrive at St George's Chapel as Ms Meghan Markle and depart as an official member of the British Royal family. 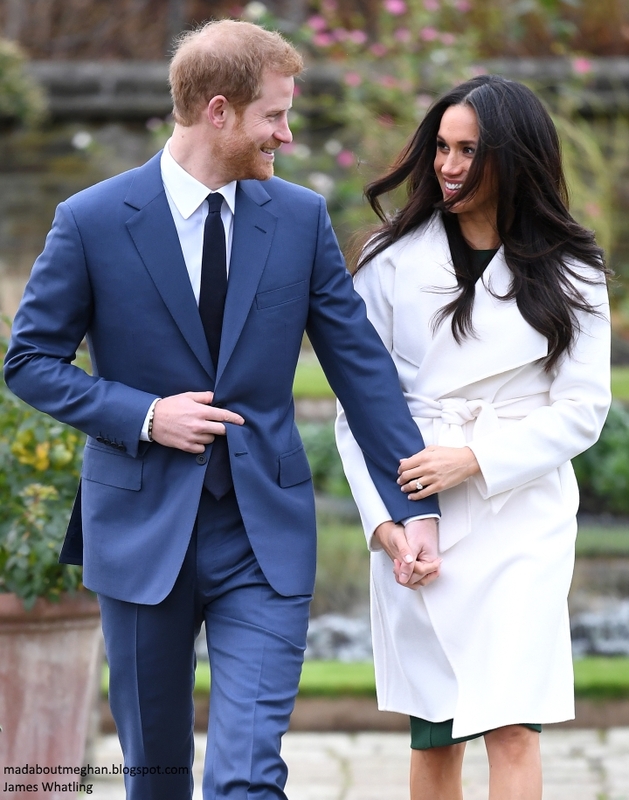 When Prince Harry and his fiancée Meghan Markle arrived hand in hand at Kensington Palace's Sunken Garden it was clear they were a couple very much in love and excited for their future together. As a beaming Harry posed with his future bride, I was reminded of his words lamenting the complexities of finding 'the one' in May 2016: "If, or when, I do find a girlfriend, I will do my utmost...to ensure that me and her can get to the point where we’re actually comfortable with each other before the massive invasion that is inevitably going to happen into her privacy. To be fair, I haven’t had that many opportunities to get out there and meet people. At the moment, my focus is very much on work. But if someone slips into my life then that’s absolutely fantastic." Following the breakdown of his second serious relationship - with Cressida Bonas - it was clear the level of press intrusion and public interest in his personal life had taken a toll. Harry's first love Chelsy Davy recently admitted her time in the spotlight as the Prince's girlfriend was "full on, crazy, scary and uncomfortable". Little did Harry know then that just two months after speaking those words he would meet the woman who would become his wife. "It was blind date for sure. I’d never even heard about her until this friend said, 'Meghan!' I was like, 'Right, give me a bit of background – what’s going on here?' I’d never watched Suits; I’d never heard of Meghan before. And I was beautifully surprised when I walked into that room and saw her, and there she was, sitting there. I was like, OK, well, I’m going to have to really up my game here and make sure I’ve got a good line of chat." 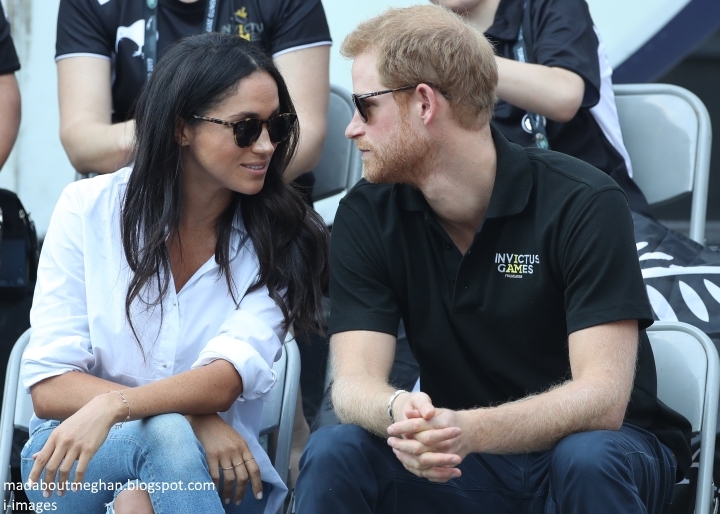 After a handful of dates, Harry jetted Meghan off to Botswana, where the couple explored the beautiful landscape, camped under the stars, and away from everything, got to know each other and fell in love. 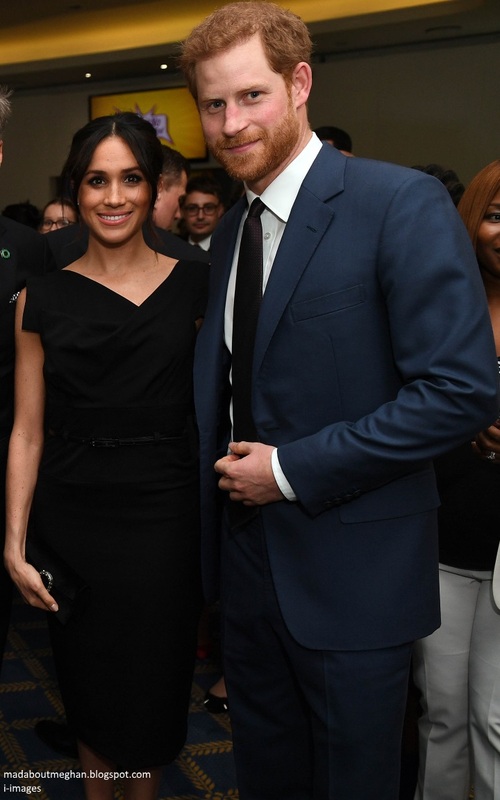 With Harry undertaking duties with trips abroad on behalf of the Queen and Meghan busy with a hectic schedule filming Suits, the next hurdle was making a long-distance relationship work logistically. Meghan said: "It was just a choice, right? I think that very early on, when we realized we were going to commit to each other, we knew we had to invest the time and the energy and whatever it took to make that happen. And so yes, with the filming schedule, it was not the easiest, because it, of course, included a lot of travel back and forth." The pair enjoyed "four or five months" quality time together before their relationship was revealed to the world. Harry and Meghan credit that time as forming the foundations of their strong bond and preparing them for what was ahead. "I tried to warn you as much as possible, but I think both of us were totally surprised by the reaction. You can have as many conversations as you want, and try and prepare as much as possible, but we were totally unprepared for what happened after that." As Harry uttered those words, his expression changed somewhat and he recalled the dreadful treatment Meghan was subjected to online and by various media outlets. In November 2016, Harry was compelled to issue a statement following the "wave of abuse" hurled at Meghan. The letter offered a glimpse into the private battles they had been fighting; "the smear on the front page of a national newspaper; the racial undertones of comment pieces; and the outright sexism and racism of social media trolls and web article comments. Some of it has been hidden from the public - the nightly legal battles to keep defamatory stories out of papers; her mother having to struggle past photographers in order to get to her front door; the attempts of reporters and photographers to gain illegal entry to her home and the calls to police that followed; the substantial bribes offered by papers to her ex-boyfriend; the bombardment of nearly every friend, co-worker, and loved one in her life". Meghan admitted she was totally unprepared for it: "I think I can very safely say, as naive as it sounds now, having gone through this learning curve in the past year and a half, I did not have any understanding of just what it would be like. I don’t think either of us did. But even though I’d been on my show for, I guess, six years at that point, and working before that, I’ve never been part of tabloid culture. I’ve never been in pop culture to that degree and lived a relatively quiet life, even though I focused so much on my job. So that was a really stark difference out of the gate. And I think we were just hit so hard at the beginning with a lot of untruths that I made the choice to not read anything, positive or negative – it just didn’t make sense. And instead we focused all of our energies just on nurturing our relationship." And the proposal? It was an ordinary night at the couple's cosy Nottingham Cottage when Harry got down one one knee. "Can I say yes?" exclaimed Meghan before he had finished asking the question. 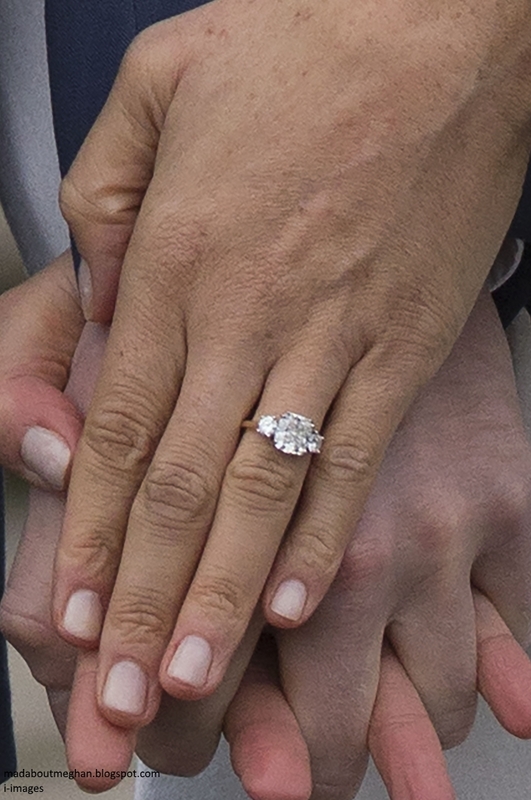 Meghan's beautiful trilogy ring was designed by Prince Harry and crafted by the Queen's jewellers, Cleave and Company. An enormous amount of thought went into the piece from Prince Harry. The centre stone is from Botswana and the two outside diamonds are from Diana's personal collection. Meghan is not only marrying Harry, she's marrying into one of the oldest and most famous institutions in the world. She's marrying a job which comes with a lifetime of duty and responsibility. Knowing Meghan would excel at this element of royal life came as a relief to Harry: "The fact that I fell in love with Meghan so incredibly quickly was confirmation to me that all the stars were aligned, everything was just perfect. This beautiful woman just sort of literally tripped and fell into my life; I fell into her life. And the fact that she’ll be really unbelievably good at the 'job' part of it as well is obviously a huge relief to me, because she’ll be able to deal with everything else that comes with it. But no, we’re a fantastic team, we know we are." Meghan's social conscience was instilled in her from a young age thanks to her mother Doria Ragland. Meghan believes her awareness began during the South-Central riots, in Los Angeles, sparked by the police beating of Rodney King, in 1991, and the subsequent riots in 1992, when she was 11 years old. "'They had let us go home [from school] during the riots and there was ash everywhere.' As the ash from street fires sifted down on suburban lawns, Markle remembers, she said, 'Oh, my God, Mommy, it’s snowing!' 'No, Flower, it’s not snow,' Doria answered. 'Get in the house.'" From a young age Meghan wanted to give back, and from a young age volunteered at a nearby soup kitchen. 'I had been in school watching a TV show in elementary school and, um, this commercial came on with the tag line for this dish washing liquid and the tag line said, ‘Women all over America are fighting greasy pots and pans’. Two boys from my class said, ‘Yeah, that’s where women belong, in the kitchen’. I remember feeling shocked and angry and also just feeling so hurt; it just wasn’t right, and something needed to be done. So, I went home and told my dad what had happened, and he encouraged me to write letters, so I did, to the most powerful people I could think of. Now my eleven year old self worked out that if I really wanted someone to hear me, well then I should write a letter to the First Lady. So off I went, scribbling away to our First Lady at the time, Hillary Clinton. I also put pen to paper and I wrote a letter to my news source at the time, Linda Ellerbee, who hosted a kids news program, and then to powerhouse attorney Gloria Allred, because even at eleven I wanted to cover all my bases. As a child growing up, Meghan struggled to find her voice and identity as a mixed-race girl, at times feeling like "an absolutely incomplete". "Navigating closed-mindedness to the tune of a dorm mate I met my first week at university who asked if my parents were still together. 'You said your mom is black and your dad is white, right?' she said. I smiled meekly, waiting for what could possibly come out of her pursed lips next. 'And they're divorced?' I nodded. 'Oh, well that makes sense.' To this day, I still don't fully understand what she meant by that, but I understood the implication. And I drew back: I was scared to open this Pandora's box of discrimination, so I sat stifled, swallowing my voice." In a piece for Elle, Meghan recounted a night she won't ever forget, when her mother was subjected to an appalling act of racism. "I was home in LA on a college break when my mom was called the 'N' word. We were leaving a concert and she wasn't pulling out of a parking space quickly enough for another driver. My skin rushed with heat as I looked to my mom. Her eyes welling with hateful tears, I could only breathe out a whisper of words, so hushed they were barely audible: 'It's OK, Mommy.' I was trying to temper the rage-filled air permeating our small silver Volvo. Los Angeles had been plagued with the racially charged Rodney King and Reginald Denny cases just years before, when riots had flooded our streets, filling the sky with ash that flaked down like apocalyptic snow; I shared my mom's heartache, but I wanted us to be safe. We drove home in deafening silence, her chocolate knuckles pale from gripping the wheel so tightly." Ellen Barry wrote: "The British tabloids have not treated her with kid gloves, featuring a drumbeat of unflattering interviews with relatives she has not invited to the wedding. But the relationship between the Royal family and the tabloids, two pillars of conservative England, was fraught with tension long before she arrived on the scene." When Meghan turned 18, she left for Northwestern University, in Evanston, Illinois—becoming the first person in her family to graduate from college - and double-majored in theatre and international relations. In line with her international-relations major, Meghan worked at the US Embassy in Argentina her senior year, "so I had been in a completely different world and then suddenly jumped into this one". During her first year, Meghan met aspiring (and now published) author Lindsay Roth. The two have been best friends since. Roth once said: "We’re the kind of friends who can be 3,000 miles away and still be talking about or thinking the same thing, and even texting each other the same thing at the same time miles away." Meghan was Lindsay's maid of honour and gave her a very special gift before the big day. From the New York Times: "When Lindsay Roth’s maid of honor called and said that she needed to fly to Toronto, she knew Ms. Markle had something up her sleeve. 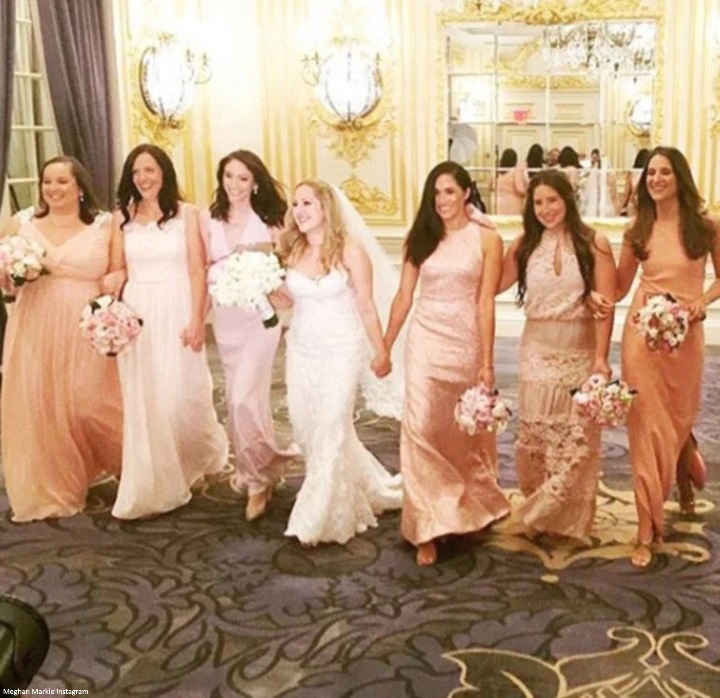 The maid of honor, Meghan Markle, an actress in the television drama "Suits," had arranged for her to have a private fitting at the Kleinfeld Hudson’s Bay in Toronto. 'I felt like the most special bride,' Ms. Roth said. When Ms. Roth tried on a Zuhair Murad gown, her entourage confirmed what she already knew. 'I knew before I even saw myself in the mirror that it was 'The Dress.' The icing on the cake was an Oscar de la Renta veil of cascading flowers that completed the look. 'At the end of our wedding night I didn’t want to take the dress (and earlier, the veil) off,' said Ms. Roth. 'I’d have slept in it if I could’ve!'" I would wager you've likely never heard the above story nor the quotes from Meghan's Northwestern classmates. For the voracious media those sorts of stories frankly lack the teeth of baseless slanderous statements made from disgruntled family members who conveniently flip-flop and alter their stories. Case in point - Meghan's half-brother Thomas Markle Jr. Last November, he told The Daily Mail in no uncertain terms: "I hope Prince Harry proposes. She’s a hot commodity right now — he better get on it. I do have a sense of pride in Meghan being successful. It was just obvious from day one that she was destined to be somewhere really big. She’s always been a princess. She’s carried herself on that level from day one." Fast forward to May 2018 and one could say he's singing a rather different tune... Or more accurately, penning a letter to Prince Harry and then providing a copy of it to In Touch magazine filled with content that could be described as nothing short of a character assassination. "Meghan Markle is obviously not the one for you. This is the biggest mistake in royal wedding history," he said, telling Harry there's still time to call it off. Meghan was passionate about acting and worked multiple jobs, waitressing and working as a calligrapher. Her big break came when she was cast as legal eagle Rachel Zane, a character which she poured her heart into. The show first aired in 2011 - the same year Meghan married her boyfriend of seven years, producer Trevor Engelson. The couple married in Jamaica. Two years later the couple parted, citing irreconcilable differences. 'Being 'ethnically ambiguous', as I was pegged in the industry, meant I could audition for virtually any role. Morphing from Latina when I was dressed in red, to African American when in mustard yellow; my closet filled with fashionable frocks to make me look as racially varied as an Eighties Benetton poster. Sadly, it didn't matter: I wasn't black enough for the black roles and I wasn't white enough for the white ones, leaving me somewhere in the middle as the ethnic chameleon who couldn't book a job. This is precisely why Suits stole my heart. It's the Goldilocks of my acting career – where finally I was just right. The series was initially conceived as a dramedy about a NY law firm flanked by two partners, one of whom navigates this glitzy world with his fraudulent degree. Enter Rachel Zane, one of the female leads and the dream girl – beautiful and confident with an encyclopedic knowledge of the law. 'Dream girl' in Hollywood terms had always been that quintessential blonde-haired, blue-eyed beauty – that was the face that launched a thousand ships, not the mixed one. But the show's producers weren't looking for someone mixed, nor someone white or black for that matter. They were simply looking for Rachel. 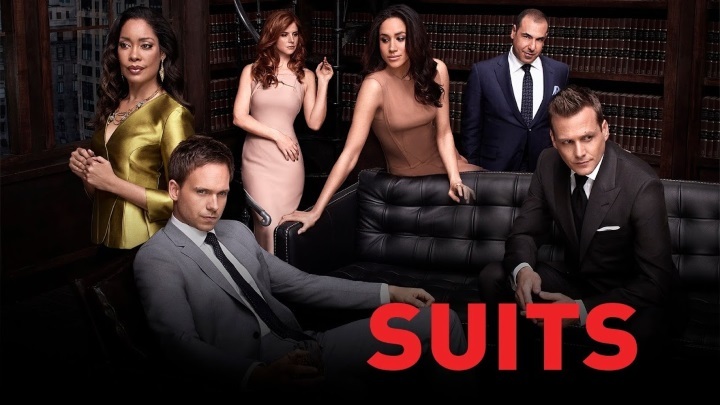 In making a choice like that, the Suits producers helped shift the way pop culture defines beauty. The choices made in these rooms trickle into how viewers see the world, whether they're aware of it or not. Some households may never have had a black person in their house as a guest, or someone biracial. Well, now there are a lot of us on your TV and in your home with you. And with Suits, specifically, you have Rachel Zane. I couldn't be prouder of that. With Meghan's newfound fame came the opportunity to explore philanthropic initiatives she had long been passionate about. With women's advocacy at the forefront of her mind, she was honoured to become a United Nations women's advocate for political participation and leadership. In 2015, she delivered a powerful speech on International Women's Day: "We need to mobilise girls and women to see their value as leaders." As an ambassador for World Vision Canada she travelled to Rwanda to support their clean water initiative. While visiting a school in the Gasabo region of the country she taught students to paint with watercolours, using water from a newly installed pipeline in their community. Meghan brought the paintings back to Canada to share the student artists’ stories and raise enough money to support additional water projects with World Vision. Meghan hosted the Watercolor Project fundraiser with 60 high-profile guests invited in March 2016. The event raised $15,000 - enough to help World Vision build a new source of water for an entire community. Meghan travelled to Delhi with World Vision to meet to meet girls and women directly impacted by the stigmatisation of menstrual health and to learn how it hinders their education. Meghan has also been passionate about supporting young people and volunteered as a Global Ambassador for One Young World - counsellors lend their global stature to the delegates' views and inspire them to create positive change. Meghan once wrote: "I honestly believe that it is our human obligation to give back. It doesn’t matter if it’s a very small act of kindness, but every little bit matters. With fame comes opportunity, bit it also includes responsibility - to advocate and share, to focus less on glass slippers and more on pushing through glass ceilings. And if I'm lucky enough, to inspire." A sentiment shared by her late future mother-in-law, Diana, Princess of Wales, who strongly believed if one has a platform to help people they should use it. 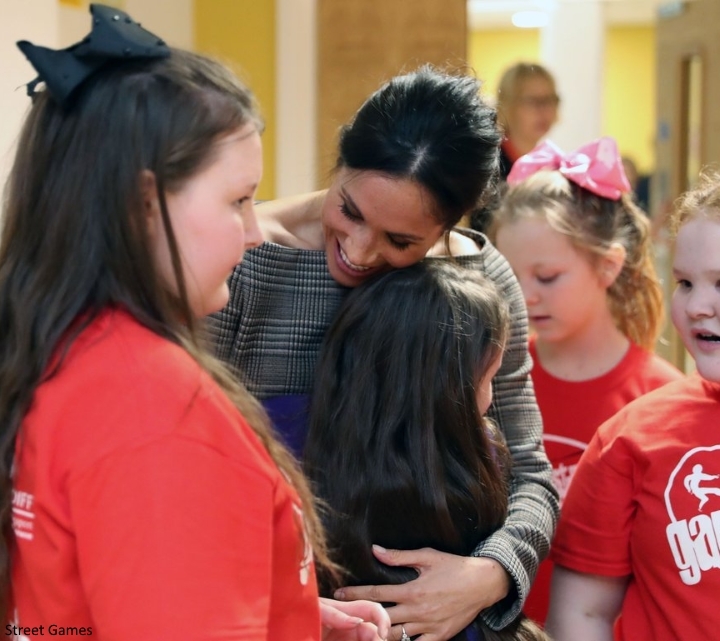 It came as no surprise when Meghan carried out her first day of engagements in Nottingham, on World Aids Day, a mere four days after the royal engagement. 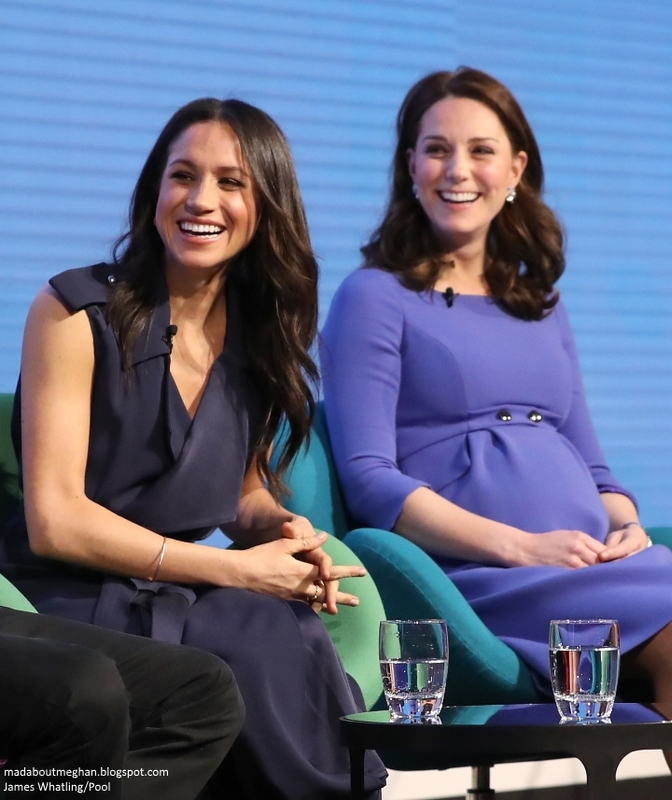 During the engagement interview, Meghan elaborated on this point, saying: "Very early out of the gate I think we realised once you have access or a voice that people are willing to listen to, comes a lot of responsibility which I take seriously and at the same time in the beginning few months and now being boots on the ground in the UK, I'm excited just to really get to know more about the different communities here, the smaller organisations working on the same causes I've always been passionate about. And also being able to go around to the Commonwealth. I think it's just the beginning." I spoke to the Mirror's royal reporter, the lovely Victoria Murphy,who shared her thoughts on Meghan's speedy entry into royal life: "There has been very little easing in when it comes to Meghan; she was thrown in at the deep end with this number of engagements before even being married. But this reflects her enthusiasm, her confidence and the fact the Royal family clearly feels she is an asset to them and is up to the job of representing them at so many different events so soon." Privately Meghan joined Harry in spending a good deal of time with members of the Royal family, including the Queen. In fact, in early December she joined the monarch at the Royal Household Christmas Party at Windsor. Wearing a burgundy lace dress, guests described her as "charming and very natural". She also joined Harry and the Cambridges for the Kensington Palace staff party. 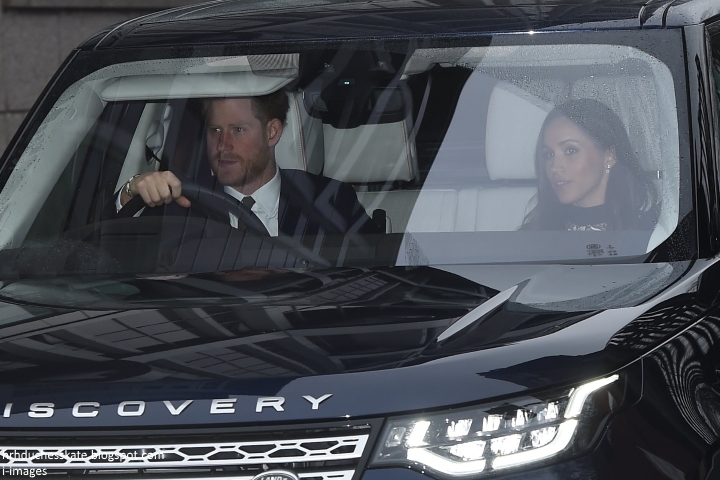 Below, Harry and Meghan arriving for the Queen's Pre-Christmas luncheon at Buckingham Palace. 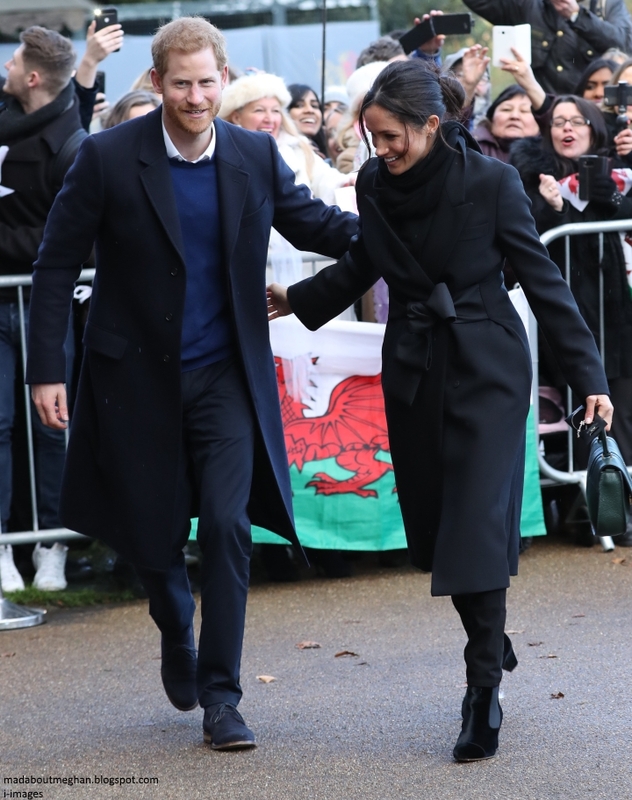 The Royal family publicly showed their support for Meghan when she became the first royal fiancée to spend Christmas Day with them at Sandringham. Camilla Tominey noted it made perfect sense as she was "already considered part of the family". It was a wonderful opportunity to get to know the other royals better. We also saw he very first curtsy as she joined the Duchess of Cambridge in curtsying before the Queen as she departed after the service. 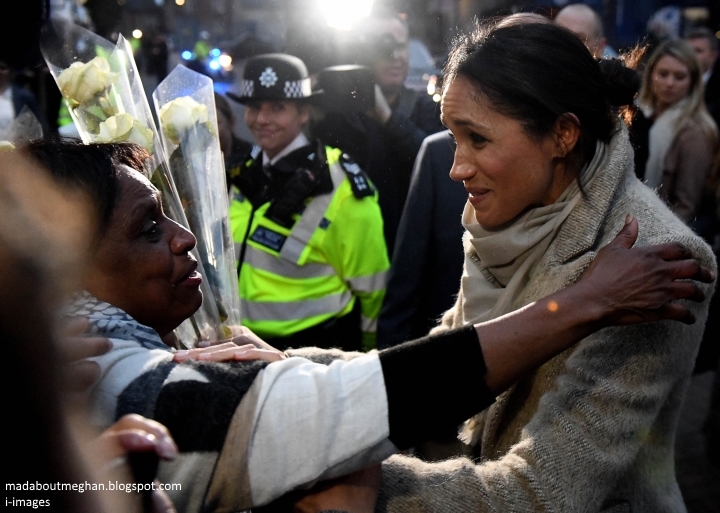 The Mail Online reported: "Sandra Wiltshire wept as she held their hands and told Meghan: 'Thank you, thank you for all you've done.' Speaking afterwards, she said: 'I just love Prince Harry. For him to have found someone who he really loves it is amazing. You can feel their love I wish them all the best. Ms Wiltshire ran a shop for 25 years from across Pop Brixton and added: 'I just want to say it was a dream to meet them. I wish them all the best and thank you so much for coming to Brixton." 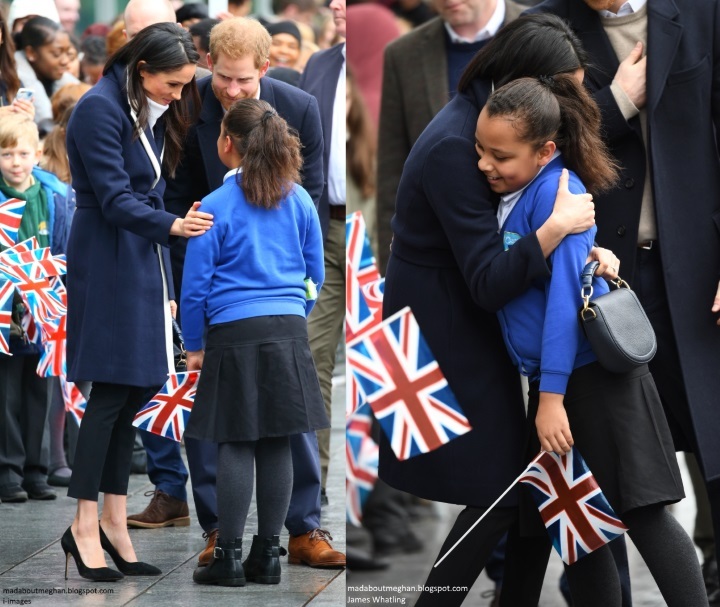 I often think engagements are remembered by moments; a quote, a conversation with a member of the public... Harry and Meghan's first joint visit to the Welsh capital of Cardiff was filled with these moments. Before they left Harry said: "Everyone give Meghan a big group hug." After a few moments the Prince smiled and said: "And release. She's mine." Meghan's reaction was priceless - a very endearing moment between the happy couple. At the Endeavour Fund Awards, Meghan took to the stage to present the Celebrating Excellence Award. She said, "I'm truly privileged to be here", before going through the list of nominees. There was a mix up of sorts with the envelopes and it took a couple of minutes before Meghan could proceed listing the nominees. She took it in her stride and laughed it off. On the eve of Valentine's Day, Harry and Meghan carried out several engagements in "gorgeous" Edinburgh during their first official visit to Scotland. During a visit to Social Bite - a café distributing food to homeless people across the city, Meghan discussed her experiences volunteering in a soup kitchen. "Giving homeless people choice in what they eat is key to "dignity and humanity". Co-founder Alice Thompson told Meghan she was "deeply inspired" by her 2015 UN Women speech. Clearly touched, Meghan thanked and hugged her. The visit highlighted the experience Meghan is bringing with her as she joins the Royal family. 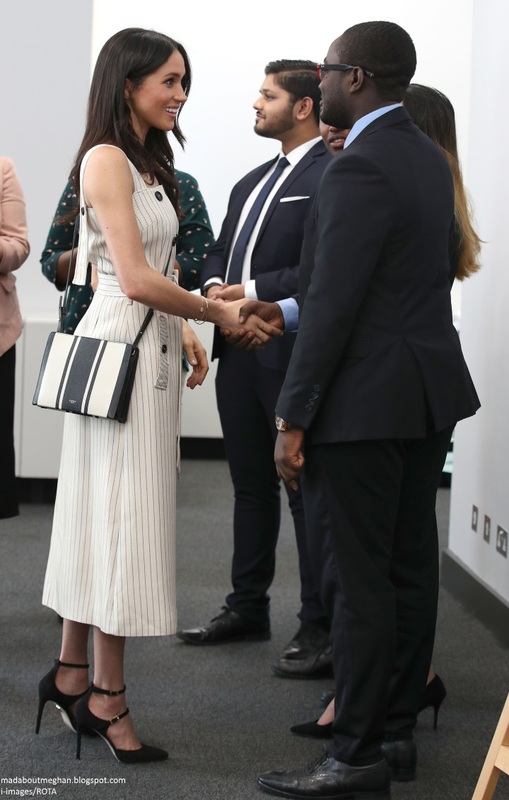 Meghan joined Prince Harry and the Duke and Duchess of Cambridge for the first annual Royal Foundation Forum in the Auditorium at the offices of Aviva, London. Meghan will become the fourth patron of the Foundation after the wedding. She touched on the importance of supporting women's issues during the forum: "There is no better time to shine a light on women." I enjoyed chatting to People's chief foreign correspondent Simon Perry who recalled his views from the day: "She has taken to the public side of royal life very well. At the Royal Foundation Forum she was polished and confident and felt completely at home voicing her opinions - raising the issue of MeToo and female empowerment. It felt completely natural and signals another modern touch she is bringing." Harry and Meghan marked International Women's Day in Birmingham and learned about projects supporting and empowering women. Prince Harry met ten-year-old Sophia Richards and asked her what she wants to be when she grows up. When she replied 'an actress' he took her by the hand over to Meghan. 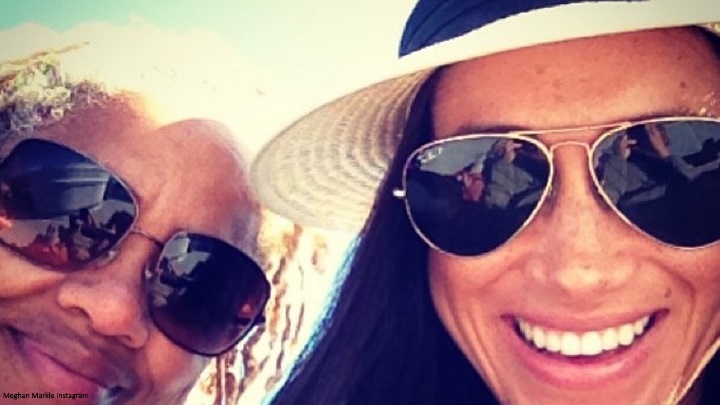 Sophia told People: "Meghan told me that I can achieve whatever I want to achieve. And Meghan said she would like to see me on TV when I become an actress. It was a dream come true. I will never forget this day." 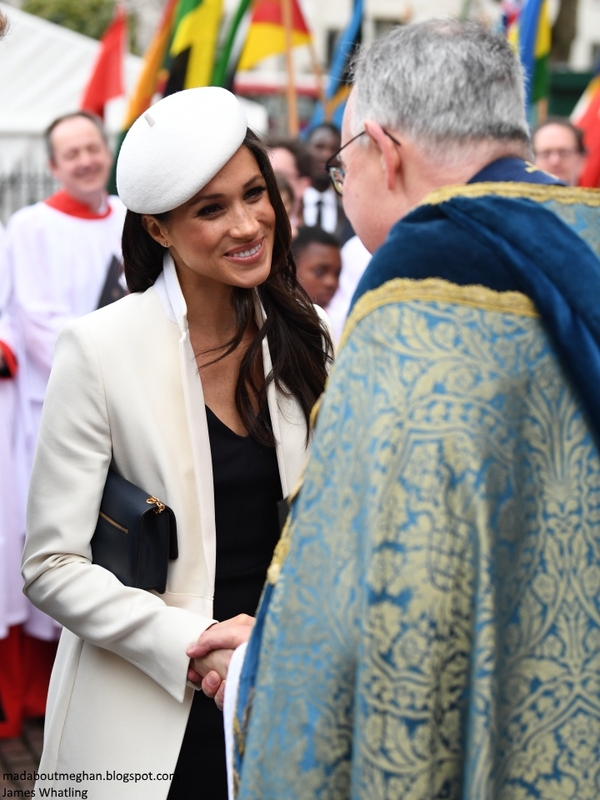 Meghan Markle attended her first official event with the Queen this afternoon when she and Harry joined senior members of the Royal family for the annual Commonwealth Day Service at Westminster Abbey. It was by far the most formal event she had attended up to that point, and it signalled both her and Harry's interest in the Commonwealth. Dressed in a cream Amanda Wakeley coat and navy dress she looked every inch a royal. 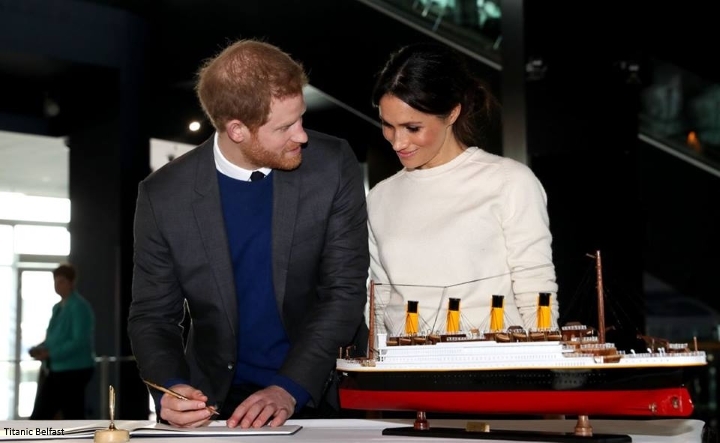 The couple enjoyed a packed day in Belfast in late March meeting members of the public and young people, and visiting the city's most-loved sites, including the Titanic exhibition. Meghan will also be keenly aware of the power her image now possesses; she is now representing the Queen on royal engagements. We've seen her become more than adept at showcasing sartorial diplomacy and supporting an array of British brands. In Belfast, she carried the Charlotte Elizabeth Bloomsbury Bag. It turns out the British brand has been supported by Prince Charles's organisation, the Prince's Trust. The Meghan Effect has already helped to put dozens of businesses on the map. Sales for Edinburgh-based company Strathberry increased by 5000% the day Meghan carried their bag. Tiny Welsh firm Huit Denim had back orders for three months. 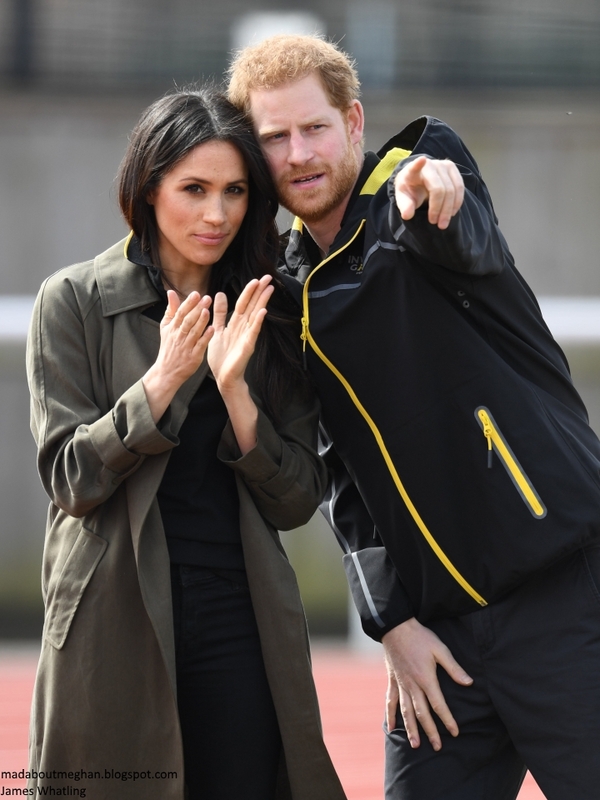 The couple cheered on hopefuls at the UK team trials for the Invictus Games Sydney 2018 at the University of Bath Sports Training Village. Meghan joined Harry for two events during the historic Commonwealth Heads of Government Meeting. 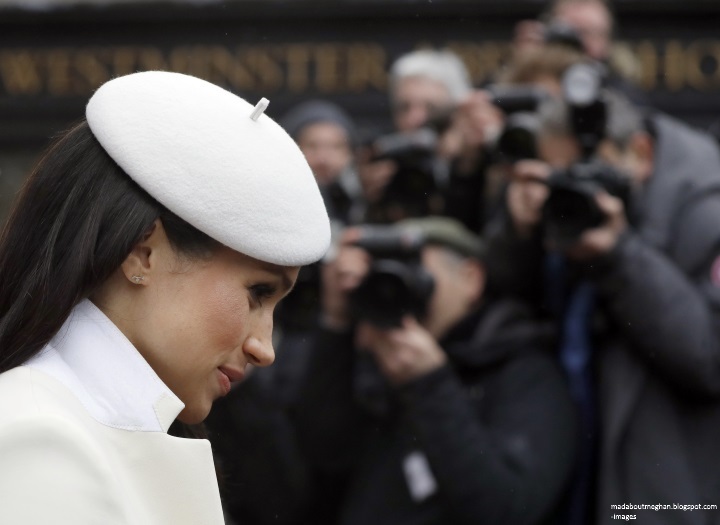 Meghan's participation was described as "highly unusual" and "unprecedented" by veteran royal reporters, who revealed it is uncommon for fiancés to take part in events of such magnitude pre-wedding. The Daily Mail reported: "Jacob Thomas, from Australia, who won a Queen’s Young Leaders award for reducing the rate suicide in the LGBTI community in his home country, said of talking with Meghan: 'These were her exact words, that this is a basic human rights issue, not one about sexuality.'" Meghan wowed in the elegant Black Halo Jackie O dress for a CHOGM women's empowerment reception hosted by Foreign Secretary Boris Johnson. The couple attended a reception for the Invictus Games with Australian Prime Minister Malcolm Turnbull. Harry and Meghan travelled to Sydney in October for the event. With the Commonwealth Heads of Government Meeting, there was very much a focus on strengthening ties, and it seemed a very fitting way to celebrate the games which has links all over the Commonwealth. Meghan took her place among the Royal family for the Queen's 92nd birthday celebrations at the Royal Albert Hall. One of the most important and emotive engagements Meghan attended was the Stephen Lawrence 25th anniversary memorial service. Stephen was murdered during a racist attack in 1993. He didn't know his attackers and they didn't know him, and the murder had a profound effect on Britain. Prime Minister Theresa May was in attendance and announced plans for the government to work with the Stephen Lawrence Charitable Trust to establish a national annual commemoration of Stephen's life and legacy every year. The 22nd of April will be Stephen Lawrence Day. 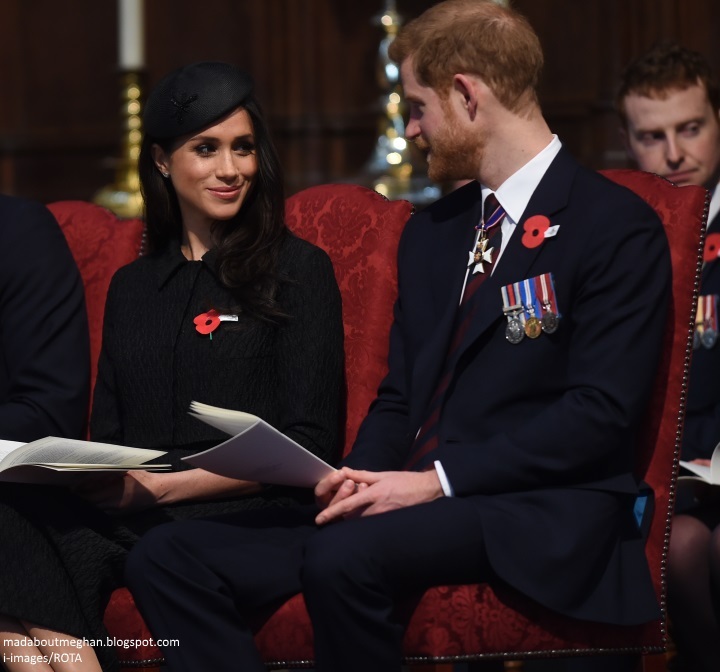 Meghan and Harry attended two ANZAC Day services. During the engagement interview Meghan said "once you have access or a voice that people are willing to listen to, with that comes a lot of responsibility, which I take very seriously". It came as no surprise to learn that Meghan has roughly 30 engagements under her belt - an unprecedented number for any royal fiancée in recent history. Expert Marlene Koenig noted both Diana and Sarah Ferguson attended State dinners and several events where Her Majesty was in attendance. Meghan's numbers considerably exceed both aforementioned ladies. Simon Perry added: "I must say I find that total of engagements amazing. But it says something about both her age and experience — she is already someone happy in the public eye and was ready for this. But also, as she said on her engagement day in November, she and Harry couldn’t wait to get going and it is clear that she has been allowed to do so in the run up to the wedding, rather than waiting until after they are married." 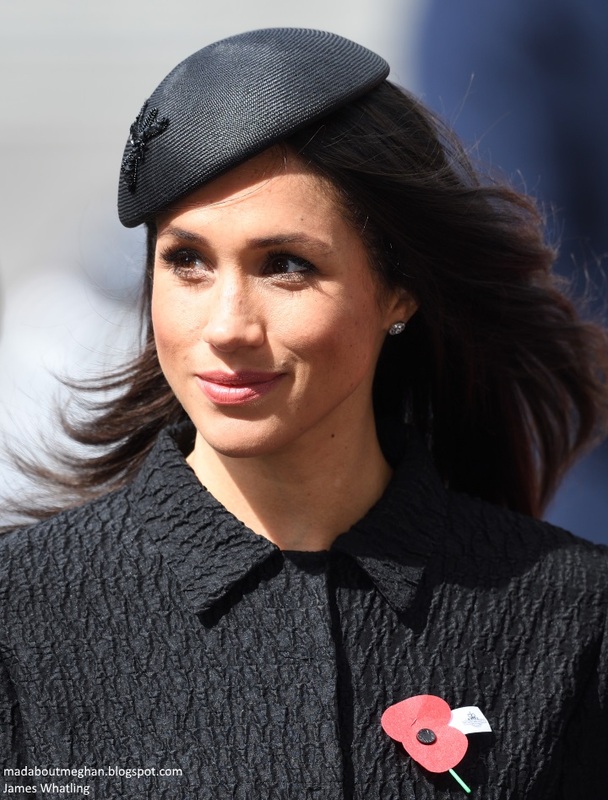 The bulk of Meghan's work and research has taken place behind-the-scenes over the past five months. At the Royal Foundation Forum she couldn't elaborate too much but said: "For me it's very important, once you hit the ground running, even if you're doing it quietly behind the scenes...what I've focused my energy on thus far is meeting with the right people, meeting with the right organisations behind the scenes quietly, learning as much as I can so I can maximise the opportunity we have and really make an impact." People reported: "She's been on a very busy schedule behind the scenes." Her efforts have focused on getting to know a wealth of charitable organisations around the UK, an array of meetings with those on the ground helping her to make an informed decision on where she can best lend her support after the wedding. 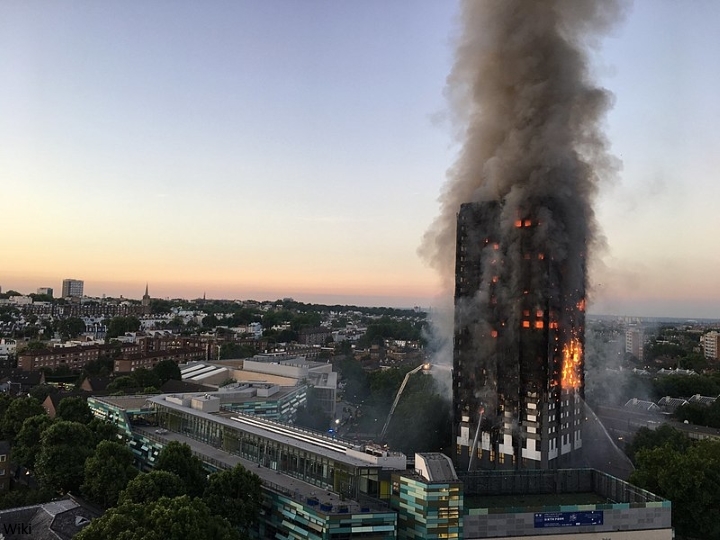 The horrific Grenfell Tower fire saw 71 people tragically lose their lives. The blaze shook the nation including the Royal family, who are still deeply interested in helping where possible. The heartbreaking event clearly touched Meghan's heart too, and she made several private visits alone. at the Al Manaar community mosque, which lies in the shadow of the charred shell of Grenfell Tower, accompanied by a protection officer and a royal aide, the future duchess met some of those affected. A leading Grenfell community member told the Mirror: "Meghan’s visits mean so much to us. She has a special place in our hearts." 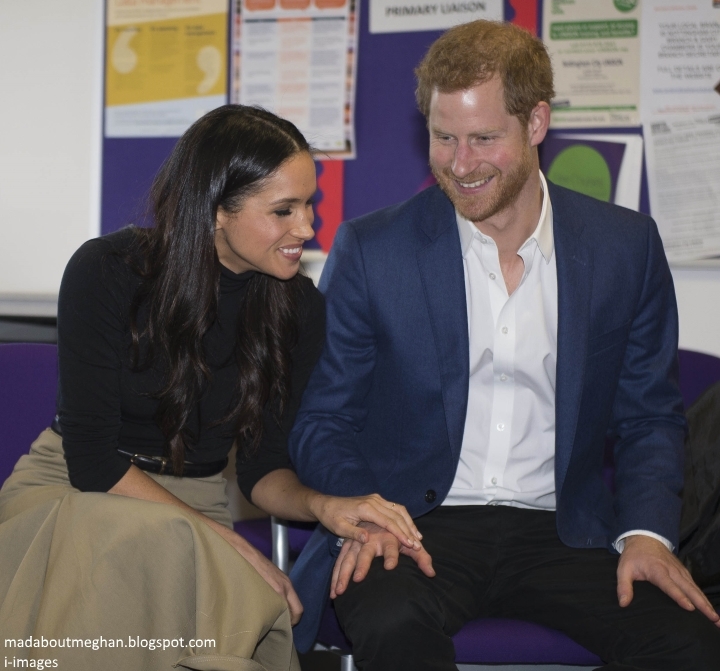 Harry revealed he and Meghan were left "shocked to the core" following a private visit to Colchester Garrison to learn about the work of the North Essex Veterans Mental Health Network, a collaboration between the NHS, charities and the MOD. The couple saw how veterans and families were left to suffer in silence. We also know she joined Harry at the Endeavour Awards judging panel at Kensington Palace weeks before the ceremony. It's clear Meghan will be joining Harry in supporting members of the armed forces - a staple of his royal work. How will Meghan use her first year as a Duchess and her new global platform? Victoria Murphy believes she will continue to champion women's issues: "I think after the wedding we will see her focus on causes involving young people and women and girls’ empowerment." Simon Perry concurred: "She has lots of ideas and I expect she will surprise us with some interesting and engaging new moves. But, yes, female empowerment and young people — both at home and abroad, across the Commonwealth which she has already spoken about and got a feel for via the recent CHOGM week — will be at the centre of her work." I was interested to hear how Harry's new Commonwealth roles and the couple's shared hopes for working in member nations would factor in. Simon Perry shared the following insight: "They’re both interested in the Commonwealth and how young people have the keys to help change their own worlds and the world at large. There will be many foreign visits — I would expect that if they go to Australia as they have said, then they would add New Zealand or somewhere else in that region. And I am sure they will visit a European country, before the fall. With the Queen not traveling and Prince Charles and Camilla being expected to do more, Harry and Meghan will also pitch in with at least two major foreign visits a year I would think." 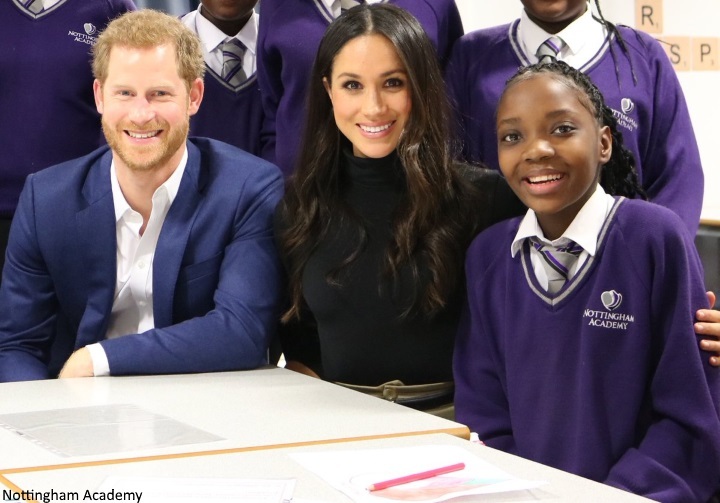 Victoria Murphy added: "We are expecting he and Meghan to carry out a lot of travel meeting young people across the Commonwealth and hearing about the issues that concern them." With the couple's decision to postpone their honeymoon, we'll see the beginning of that work just days after the wedding. The next week will be filled with a haze of last-minute preparations and welcomes for family and friends. They will join members of the Royal family at a dinner hosted by the Queen; no doubt it's going to be a particularly special time when Meghan and Doria arrive at a private location to spend the night before the wedding. It's going to be terrific to see all the planning come to fruition on the big day. When Meghan Markle steps into her wedding gown in eight days and walks down the aisle of St George's Chapel, the enormity of that moment will not be lost on her, nor will the knowledge her life is about to irrevocably change forever. I don't think there's a woman better prepared or equipped to embrace every moment of it. Wow, this was really wonderful! Thanks for putting all of that together, the pictures and backstory. I not only love Meghan but as someone who's followed Prince Harry over the years, it's so lovely to see him this happy and content after everything he went through with the death of his mother. I think they'll have a wonderful, supportive marriage and it'll be a joy to watch from afar. Thank you, thank you, thank you for the fabulous love story you have written. I like all your readers greatly appreciate the time and energy you have put into the telling of a wonderful romance filled with love, joy and responsibility. In reading I felt like I was walking through the last year and a half with Harry and Meghan. It has brought a true smile to my face and affirms the anticipation of waiting to watch as fairy tales do come true. Wow! An amazing summary! Thank you! Looking forward to next Saturday, and how her future enfolds. What a GREAT post! I had tears in my eyes the whole time I read it. Meghan is brilliant and she is going to bring out the best in Harry and the other members of the Firm! I was raised with the belief that to whom much is given, much is required. Harry and Meghan seem to believe that and are showing their efforts to honor that belief in every way. I am truly looking forward to watching Meghan navigate her new existence and do her part to change the world. That was beautiful, Charlotte. Thank you! Aaaaah this is too much Charlotte, (pass on the tissues) what a moment for Meghan! Oh Charlotte, I haven´t read through the article yet - but the vibe I get is just: THANK YOU SO MUCH!! And THANK YOU to all the contributors!!! I just can´t wait!! I was rooting so much for this couple from the very beginning - well, those who followed from the beginning know that only too well (ahem!! ;-)) ). I just wish them every possible happiness that is on this planet, may their love grow each and every day!! May God bless Meghan and Harry and may my mom and Diana be happily sitting on the clouds and watching the wedding, crying, laughing and hugging.... I will be thinking of them both during the wedding - and raise my glass.. Cheers, you two!! Cheers, Meghan and Harry! Eve, what beautifully written words. I do not think our loved ones every truly leave us. I will be thinking of your mother sitting with Diana while we are all watching the wedding! Love, love, love this thorough post! Thank you for sharing the stories that are hard to find in the media. Charlotte, both of your blogs are amazing. Well done Charlotte! Beautifully written post! It is, indeed. Charlotte always does an amazing job. But Courtney!! Nice to see you! Thank you! I've been lurking. Mostly because I've started a job for the first time in over a dozen years. Managing a part time job, three children, my illness and a husband gone often has been exhausting. The run up to THE wedding of the year is giving me life! So happy for Harry. His loneliness the last handful of years has been apparent. I'm glad he found MM. I'm not working on the wedding day or the day before so I'll be around. PS this group of people, and the two blogs, are never far from my heart. Courtney, you sound like you could look at Meghan’s schedule and say “Oh wow, look at all her free time!” I hope you have two restful days off next week to soak in all the wedding excitement. I am glad you decloaked if only for a second, Courtney. It's nice to see your name. Hope you get to be here next week for the wedding! Thank you very much Charlotte,such a fantastic post,a few days before the Wedding! We had the opportunity to recall the exciting story of a young woman who will be a Duchess and will work for the United Kingdom as a charming ambassador. She is fantastic,a role model,born to be a modern active and inspiring princess. Well done young lady, how concise, informative and eloquently delivered! Thank you for all the work you do! Wonderful summary and assessment! Thank you for all the work that went into this post. OMG, Charlotte!! I have tears in my eyes. You have so beautifully captured Meghan during this period of enormous life change, leading up to her wedding to Harry. You have put together a marvelously written and edited timeline. I am a big fan of H&M, and I am a total fan of you and all your efforts. I know I will come back to read this entry again and again. THANK YOU!!!! I'm literally crying as I read this. I am so in awe of this beautiful, intelligent, graceful, compassionate, passionate, kind, gentle woman. I have seen the UK racist media try to paint her in a bad light but from what I've seen from past memories and photos is that she has always been this person, not a vulgar action or photo is in her history. It is like she was born to be royal and to do good in the world. I feel so immensely positive about this fabulous couple, both for their love and what they will do in the world. The stars were aligned indeed. To say I am looking forward to the 19th May would be an understatement. I won't want the day to end! I wish them both an ecstatically happy and loving marriage, but especially Meghan because I don't see the hatred and cruelty letting up and she needs as much love as there is to give. She deserves only the best. Thanks for this blog which is a welcome oasis in the sea of bile, and provides such delicious details and stunning photos. Has there yet been any hint as to how Prince Harry and Meghan will be styled on the day of the wedding? I would so love it if they were to be the Duke and Duchess of Windsor - it would be so appropriate and an excellent way to shed the darker history of those who previously were styled as the Duke and Duchess of Windsor. The other thought I had if Windsor were not in the cards, and I have no idea if such titles exist, but I thought it would be funny if William and Kate were the Cambridges and Harry and Meghan were the Oxfords. How ever they are styled, I can hardly wait for the big day. Thanks again, Charlotte, for your wonderful work! How long was it before they announced the official name of W&K? Was it the same day of the wedding? I like the The Duke and Duchess of Oxford better than of Windsor, I feel like they need a different name than of the an abducted King. I would be shocked if Queen Elizabeth would do the Windsor just alone the divorce similarity. There are to many negatives that she lived through during that time period. I wish it would not as it is time to get rid of the connotations connected to the name. I agree it would be cool to have the Oxfords and Cambridges. I believe the title was released shortly before the wedding, on the day, if I am not mistaken. Please! No Duchess of Sussex! Meghan will have a tough enough row to hoe as it is. After the initial high of the wedding and its aftermath, the media would make a mockery of the title. Duke of Clarence? About 50/50 on the historical scale and certainly with no more baggage than the Duke of Windsor title. It is a title that has been long out of use and should have no modern day associations. (I believe a Queen Victoria son had that title, about whom rumors circulated and even a famous lawsuit, if I remember correctly) It is also an historically relevant title: the First Duke of Clarence was the third son of Edward III and the sire of a long line of Plantagenets through the female line. There is also the possibility that the Dukedom of York will eventually be Harry's. Since Prince Andrew shows no sign of starting another family to produce a son and heir to the title, the title would revert to the Crown. Harry would be given an Earldom initially (he is already a Prince) as a sort of place-holder--as is rumored is the case with the Queen's third son, expected to become The Duke of Edinburgh. I have begun to wonder if Prince Edward will receive that title after all. It may be that HM would prefer to retire her beloved Phillip's title for awhile until people have had time to process his loss, when that sad day comes. The title is usually announced on the day of the wedding, in time for the groom to appear as newly-styled "Duke of..."/"Earl of..." to the ceremony. Looking back, Wallis Simpson was a "blessing in disguise". Edward VIII was quite "political" even as Prince of Wales, he famously promised miners on strike things that weren´t his to promise - at least it was considered by the government not to be his. His penchant towards "National Socialism" - and therefore to Nazi Germany, is well known. Imagine what would have happened if Hitler had the British King as supporter!!!! I hope it's Duke and Duchess of Windsor myself and wonder if it really would be a negative thing. 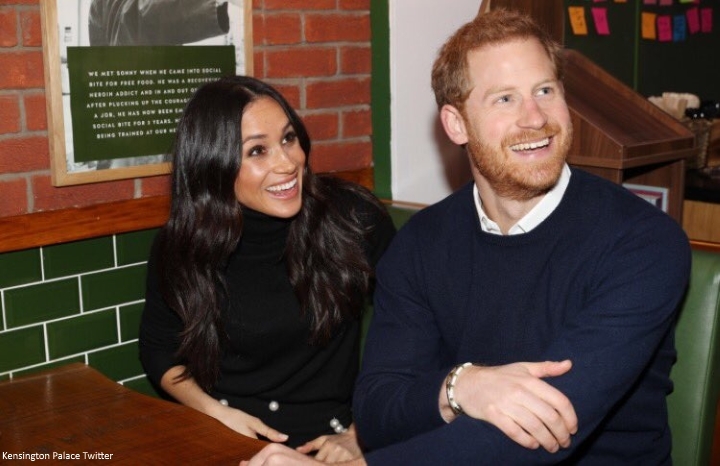 After all there is so much positive associated with Windsor - the name and the place, and it's certainly a place that has and will continue to hold special meaning to the couple. Also, the Duke of Windsor, former King Edward VIII, has been dead for 46 years now. And Harry & Meghan will make such a positive impact that any negative associations with the name (held by the older generations I might add), will soon be forgotten. The history of Windsor is rich and so important to the fabric of the British. 🌸 Eve. Thank you. The Queen giving Andrew four of Edward’s names shows the warmth of the Queen. I think any furor over Harry and Meghan being given the titles of the Duke and Duchess of Windsor will end up as nothing more than a tempest in a teapot. Harry and Meghan are going to be powerful in British history. And, I agree, let us let them do that revival of the titles of the Duke and Duchess of Windsor as they go along that powerful way. Wonderful celebratory post leading in to the week of the wedding. Great job, Charlotte! Ms Markle has made it through most of the scrutiny and racial comments and right out lies. So, I agree with you Charlotte, Ms Markle certainly appears to be well prepared for her life as a Royal. Still tho, she has my prayers. Thanks for this excellent recap! You’re brilliant, Charlotte. Enjoy your blob so much. Fantastic article!! Thank you for this well reasoned, truthful sea of calm among the rough waters when it comes to articles about Meghan, and Harry and Meghan and the wedding. Thank you, Charlotte. I’m so delighted that such a lovely, spirited, American woman is joining this thousand year institution. I believe she will contribute much to her new family, and make that sweet Harry a happy man. Aren’t you the lucky ones? Thank you,Charlotte,so much.You are amazing ! Please give me a moment... An African American/ Biracial woman is marrying a prince in the BRF!! So excited! My heart cannot take it, May 19th just be here right now! Lol! Thank you Charlotte. This is a wonderfully written piece covering Meghan. I appreciate your positive outlook. I also appreciate all the research you do about the philanthropies. And of course I enjoy the fashion aspect of this blog. It's my favorite blog and the only one I check (well along with HRHDuchessKate :). I think Meghan is going to stir it up a bit. As a history buff, I'm not sure if I like that but it will be very interesting to watch and honestly, I think the BRF could use a bit of a shake up. I think she's going to embrace the fashion side of things and I hope she can show some restraint. I think she is going to highlight smaller philanthropies where she can make a huge difference. I love that she will be working on women's rights and young peoples potentials. Cheers! Thank you for your wonderful profile of a really great love story. As someone who has used Meghan as a role model for both my kids for years (I used to follow The Tig)it's nice to see again just how much of an inspiration she is to people. Can't wait for next Saturday and the gown, the shoes and "THE TIARA". Someone else mentioned the title of Duke & Duchess of Windsor; if anyone can change the perception of that title it is surely Meghan and Harry. She seems to have such a passion for Windsor and Frogmore House. I can see Harry and Meghan living at Frogmore House soon and maybe even Windsor Castle when William is king. William and Kate may opt for Apartment 1A when they are not in residence at Buckingham Palace, leaving Windsor Castle available for Harry and Meghan. Don’t know what they’ll do about Amner Hall and Sandringham when William becomes King. Or Balmoral. What a wonderful; informative article. Thank you Charlotte. There are several TV films about the couple over the next few days, but doubt they will give more info than you have in this article. Just a week away now and I will be glued to the TV watching the wedding and wishing them every happiness in the future. The country is really fortunate in the two brides chosen by Diana's sons. The Monarchy is surely safe in their hands. I doubt they will too Jean. In fact, my husband just turned on one of the programs and I told him there was nothing they could tell me that I don’t already know! Charlotte, my deepest thanks for this beautiful tribute to Meghan! It's wonderful to have her commitments and her entry into the U.K. royal family so well described. I know that she has renounced her American citizenship, but for me, she personifies what is best about the U.S.--generosity, commitment to people of all backgrounds, genuine love and responsibility to use her gifts and her voice to make a difference in our world. Harry once said that she and his mother would have been "thick as thieves." Having admired Diana for years, my heart is full to see Harry marrying a woman so much like his mother. Thank you, thank you, and can't wait for May 19! Well said anon! And my thoughts exactly! Beautifully written Charlotte! Thank you so much. Can’t wait for the wedding and all that these two will do together as husband and wife. They do seem like a great team. Wow, Charlotte, this is fantastic. In reading this, I have come to the conclusion that Meghan was born for this job. She is an amazing woman and will do a fantastic job of being a princesss/duchess. The fact that she has come through so much to get here and has risen above it all is so inspiring to me. I don`t know her but she makes me feel so proud and I have a feeling that she will make it onto my list of most inspiring women. I absolutely love the fact (as Shantel said) that they seem to believe "to whom much has been given, much more shall be required." These two are amazing and I wish them all the love and happiness in the world. I literally had goose bumps reading this post ! Charlotte without doubt you're a gifted writer. I hope you know how grateful we all are for the time effort and passion you put in to each of your posts. They are a joy to read ! What an amazing time ahead for H&M, you can't help but wish them all that's good and positive, not just for wedding but for the amazing future they'll have together. Lovely post. It’s nice to see some of the positive things she’s done focused on. That was a tremendous post, Charlotte! What a thorough, informative, insightful and compassionate portrait of Meghan and her journey thus far. You have boundless energy and devotion to your blogs and the ladies that they are focusing on. Please never stop....the internet needs the positive and accurate depiction of Meghan's and Kate's lives and work. Pam, I second everything you said! Well done Charlotte! Bravo Charlotte Bravo!!! I have yet to read such a wonderful article about Meghan and believe me I've read lots. You truly captured the essence of this passionate, compassionate, kind and caring woman. I am just thrilled that she and Harry have found each other, they truly seem made for one another! I've long been inspired by Meghan style and fashion sense but having read this article I'm now inspired by her passion to help others. She does so much more than walk the talk, she truly puts her heart and soul into all she does! And I must say how impressed I am by the way she's "hit the ground running", taking into account she's in a new land with new customs and marrying into the most famous family in the world! Thank you Charlotte for such a wonderful and inspiring article! I can't wait to join you and all your wonderful readers here next Saturday for what I'm sure will be a joyous and blessed day!! This is really a stunning post!!! The attention to detail and the love that went into this are amazing!!! Thank you so much. You are as amazing as your subject. Charlotte, this is such a beautifully crafted blog post!!! Such a ray of light amongst the vitriol written about Meghan. I can't believe the wedding is almost upon us; it seemed ages away! I wish Harry & Meghan all the love & happiness they deserve. I have two questions. Is there any prohibition on royal woman having longish fingernails? And might Prince Charles be on first-name basis with Meghan's parents after meeting them or are Doria and Thomas not allowed to do such a thing? I think it would be very hard for an American parent to not call their child's in-laws by their first names. I wish the future duchess the best. What a L O V E L Y article Charlotte! Just lovely. I had never heard Meghan's brother say she was a "hot commodity". Wow, I guess that shows you what is important to him in life. Well, I can't wait to see the dress and I wish the new couple every happiness and especially long-lasting, forever kind of love. Thank you for this post especially in the light of constant ugly bashing by the Daily Fail. is a good example of Meghan's work. Compassionate and thoughtful. Thank you Charlotte. I really admire the way you tackle this blog and give us all the information we want. It must take up so much of your time - thank you for your gift to us! Wow!!! That was a wonderful recap of all that has happened and the engagements done. You are a fantastic writer. Thank you Charlotte! That was a wonderful summary. I have the utmost respect for Ms Markle as a person. And I'm looking forward to her accomplishments during the next decades. You pages are, as always. most excellent, Charlotte. Since I have noticed one or two other commenters with the first or middle name "Virginia", I decided to add my first name for clarification. I go by my first name anyway, but I had chosen to use my middle name originally because there were other "Sarahs". Now, I'll just use both. I haven't commented in a while because work has been very, very full and when I come home, all I want to do is spend time with my husband and young children, and relax if I can. I'm looking forward to Harry and Meghan's wedding next week (and that's an understatement). Charlotte, thank you for writing this particular post on Meghan's life and work! I am excited about her philanthropic work and about the life and family that she and Harry create together. They, a long with William and Kate are a "Quartet for Good" - giving compassion, empathy, service, a listening ear, love, and acceptance to those who need it most. While I am not a proponent of such "titles", if I had to choose one for Harry and Meghan, it would be The Duke and Duchess of Windsor. I fully recognize the tragic history of that title, but I believe it is time for those titles to have a new history, and there is no better pair to write that history than Harry and Meghan. Sarah Virginia, I too would like to see Harry and Meghan rewrite history with the title Duke and Duchess of Windsor. The both have indicated their love for Windsor and appeared to have spent alot of time on the grounds. Not in the Queen’s lifetime! It’s incredible how much she has integrated into the family and new life so quickly. It is wonderful to see Prince Harry so happy - these last few years, he didn’t seem as happy as he does now. Meghan knows the power of social media (her blog for one) so I wonder if we’ll see an increase in social media postings from their official account. Out of everyone, I think Meghan & Harry and William & Kate would be most likely to increase the family’s presence and harness the power of social media to highlight their causes and charities. I know they’re still the royal family but I think there is a way of connecting and communicating and not losing their royal family image. Splendid work, dear Charlotte. A beautiful, touching and uplifting tribute to Meghan. I suspect that you might become her official biographer one day. So looking forward to Saturday. Philly, after reading her beautifully constructed homage to Meghan, I too hope that Charlotte will one day become Meghan's official biographer. In fact, ever since Charlotte started DKB, I've been hoping that she would write a biography of Kate using her own critical insight and from her unique perspective garnered over the years. My hope is now two-fold as I read each new posting about Meghan on MAM. Do give it some serious thought Charlotte, that is if you haven't yet done so. You'll have the support of many of your readers, I'm sure. 🌸 So true, Wecy. Charlotte is already (even legally verifiable by all her existent past DKB/MAM) an unofficial “Royal Biographer”. It would not surprise me in the least if the title soon becomes “official”, yay 🎉. In fact, I will be very surprised if it doesn’t. Lovely and informative, thank you, Charlotte.....well done! Wow Charlotte, I can’t thank you enough for your thoughtful, insightful blog! Fab writing. Totally agree Meghan is ready and able to make a real and lasting impact. You have been given a Gift. To quote Shantel, to whom much is given, much is required, you eximplify by sharing your creative talented Gift with the world through cyberspace. We are fortunate to find a safe place filled with the true facts presented with high class. Because of your ift, I often wonder what is your career in life aside from these well written two blogs. Did you even begin to imagine when you began the Duchess Kate blog, you would be writing about her royal brother-in-law's future wife, Mad about (soon to be Duchess) Meghan? I'll never forget when I wrote you an email long ago that you took the time to answer me back. Thank you for these two blogs, sharing your Gift, and for being who you are. As Duchess Kate would say, "well done." Charlotte, you outdid yourself again with this post. It’s a great recap of Meghan’s life and work. Bravo! Thank you, Charlotte, for your wonderfully eloquent summary. It is too easy to forget just how much Meghan has accomplished in her life, and just how talented she is. I do not read the garbage written and published about her, but I fully believe the descriptions from those who have. Such cruelty. Meghan's own writing is extremely elegant and meaningful, her meetings with the people she goes to visit are lovely, and those who denigrate her should know better. It is amazing that, given all she is doing, Meghan looks fresh and radiant whenever we see her, with no sign of fatigue or boredom. I am actually glad that she will have the next few months in the spotlight of royal life; with Kate quietly on maternity leave, there will be fewer comparisons and less overshadowing of Meghan by the press as she moves into her future. I hope that future will be safe, happy, and beautifully productive. Many thanks to you Chsrlotte for giving so much information regarding this lovely couple. It's always a pleasure reading all yout post and comments on this blog. Saw a "new" item that her father drove a very pretty pot of flowers to leave on her mother's doorstep; I may be nuts but I thought that was very sweet!!! He's looked rather pleased with himself. And what a great Mother's Day gift from Meghan---"Mom, for this Mother's Day, why don't you fly to England and meet the Queen and help me marry Prince Charming? We can drink some Tig and discuss how to decorate a huge apartment and a huge house." Loved seeing all of the photos again. My favorite was #19 - the woman in the crowd reaching out to Meghan, hand on Meghan’s shoulder, and the police woman in the background looking over at them smiling. 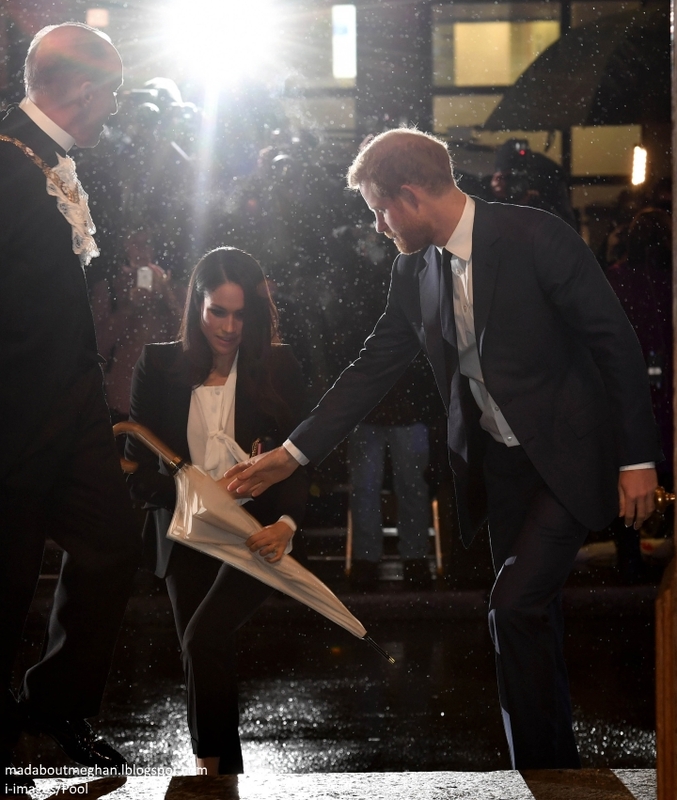 That photograph is priceless and sums up everything that Meghan is about. Charlotte, I have to join the masses and tell you Well Done! I’m quoting other commenters I’m sure when I say your work is insightful and lovingly done and a gift to us readers. One that I certainly cherish! Your reporting is thorough, informative, and well-crafted. Thank you thank you thank you! I always enjoy reading your posts. Anonymous 19:42. Apologies for typo - Charlotte, I love your blog, not blob! Your beautifully written post is a great tribute to the woman of substance that is Meghan Markle! Thank-you for this, beautifully written. I do love your positivity and eye for detail. WOW!! What a comprehensive article you have written!! Bravo Charlotte!! I have been rooting for this couple from the very day the news was leaked about their relationship. I had watched Meghan on 'Suits' for years before that and always related to her character...for a number of reasons. Anyway, getting to know Meghan the person, not the character "Rachel", has been a treat--as I truly believe that she is an exceptional partner for Prince Harry!! Additionally, if anyone is interested, there is a Lifetime movie titled "Harry & Meghan: A Royal Romance" which premieres in the U.S. on Sunday and will also be available online on the Lifetime channel website. Dear Charlotte, you have outdone your own excellent standard and provided such a comprehensive summary of Meghan Markle's life that I feel no need to lose sleep looking for more coverage leading up to the wedding. I'm going to reread this post and watch their wedding and wish them all possible happiness and success. Wow! Just wow! What an incredibly sobering and powerful post Charlotte! I'm actually speechless because even though I've been a fan of Suits from day one, I did not know much about Meghan before Suits or off-screen. She is an extremely mature, good-hearted and compassionate woman who is going to make such a meaningful contribution to whatever she does. I love the quote at the end. Meghan's been very open about being bi-racial and the struggles that come with it. While I'm not bi-racial, I am still a woman of colour and I can truly relate to the struggle of not being offered certain jobs because of my skin tone. I applaud Meghan for bringing that issue into the spotlight because it still exists today. Raising my glass to you today Meghan! Me too, as a woman of color with the struggles and the joy that comes of being one. Like Meghan said on the Tig, "know your worth". I join you Avee in saying cheers to Meghan! It´s the same principle over and over again. Whether it´s "race" (a concept I strictly put into question anyway), gender, religion, nationality, whatever - any kind of prejudice is a DISGRACE for the human species!!!! There´s still a LOT of work to do. We can all start with our own children - or the children of our siblings, neighbours, friends. We teach our boys and girls that prejudices are WRONG, that we are ALL simply human beings, that being able to bear and/or raise children is a GIFT, that there is a solution to every problem as long as we work on it TOGETHER - things will change. We don´t have to wait. We can start NOW. In our family, our community, our workplace, at the ballot box. No excuse. Anon and Eve, you both said it so well! While race still continues to be an issue in the workplace, being a woman in the workplace also means that you have to work that much harder to be taken seriously. Eve, thank you for also summing up the prejudice we face regardless of our skills and qualifications. You are so right, we can change the narrative and we should start now. What a BEAUTIFUL summary of these past whirlwind months, Charlotte!!! You´re doing such an amazing job!!! I know Meghan claims that she doesn´t read ANYTHING written about her - well, she should think AGAIN. Your blog is fantastic, insightful, informative and always as level-headed as possibly possible. She´s got one very special advocate in you!!! "Thank you" isn´t enough to express my gratitude and respect for you work!!! On a side note: I have just checked a couple of weather forecasts online - NONE said it will rain next Saturday - they go from "cloudy" to "cloudy with sunshine spells" and about 18-20 C - ideal weather!! It might be breezy, though, so I hope Meghan´s wedding dress designer has this veil well attached, lol!!! Well done, Charlotte, thank you so much! I wish everyone who is just getting to know Meghan would read this wonderful piece of yours first. You are a very talented writer and you bring fairness and joy to many! Looking forward to the wedding so much! And what a milestone for you and your blogs - you started DKB just after Kate and William's wedding, right? I'm sure those seven years have been an important part of your life, too. Best wishes!! What a good highlight of turning points and summery of the story this blog is. It makes a complete magazine especially with your comment. Your menu tabs have changed; I looked for “Meet Meghan” tab above in the menu selection, and realized the reality of changes. 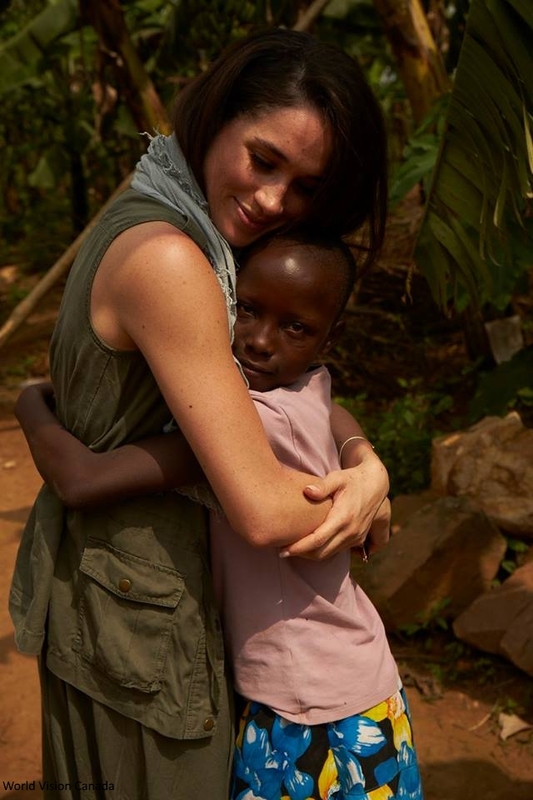 The discussion was hot on the blog- under that sub title, which one of the photos you have posted here, Meghan in Africa representing World Vision. Their engagement was announced may be a few weeks after the “Meet Meghan” blog. Most favorite photo here is the one that says, “Heck, let the world know we are a loving couple, on duty, and sharing our moment with you”. Meghan’s Vanity Fair interview, “in time we will present ourselves and story (something to that effect) was unveiled during Invictes games Canada. That was a season of love, surprise and news / 2017. 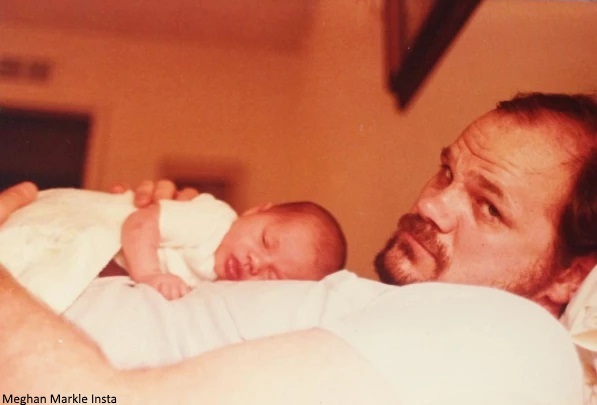 What touched me most on this blog, which also reflects your in depth maturity as a 20 something, is posting her photo as a baby on her father’s chest; the photo with her mother, one person she is very close to. It reassures comforting security in all the storm of family controversy laundered in public while MM’s stars are in “perfect alignment of the stars” with Harry, as he put it. Have a nice weekend, see you next Saturday. 🌸 P.S. Anon 15. I can even see Harry and Meghan living at Windsor Castle 🏰 when William is King, as William and Kate may opt for Apartment 1A rather than Windsor Castle when they are not in residence at Buckingham Palace. That would be a lot more convenient and more homey to them perhaps. Even Charles may opt for Clarence House when not in residence at Buckingham Palace for the same reasons. So that means that Harry and Meghan could have Windsor Castle 🏰 as their home, and the titles of Duke and Duchess of Windsor that go with it. Don’t know how they will all work out Amner Hall, Sandringham House or Balmoral when the time comes. Hopefully it will be a long while before we find out. I understand Sandringham and Balmoral are personally owned by the sovereign and would normally pass on to the next Monarch ( Charles.) They seem to be used for their holidays mainly. 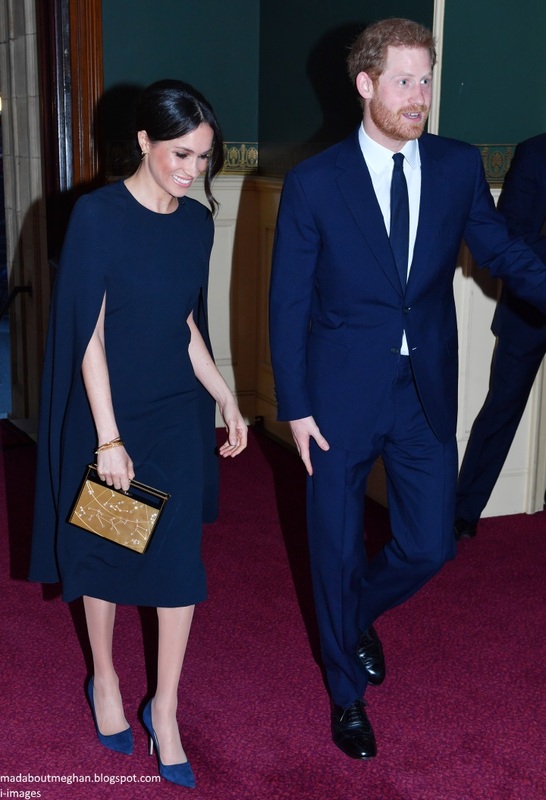 However there are separate houses on those estates which could be given to Harry and Meghan, just as William and Catherine have been given Amner as their country residence. Windsor Castle belongs to the State as well as being the place that the Queen spends most weekends visiting. Buckingham Palace also belongs to the State but hasn't the same historic associations. (After all their chosen family name is Windsor.) Buckingham Palace apparently needs major renovations, so is the most likely one not to be used. Apparently the Queen and the Duke of E didn't want to move from Clarence House into Buckingham Palace when she succeeded her father, so maybe it is not entirely up to their personal preferences. Kensington Palace and St James Palace seem to be used for royal relations and present or retired retainers. Of course the Prince of Wales has his own properties as well, which could be passed on to Harry and Meghan in due course. 🌸 Annette. Thanks. :) Definitely lots of options. There had been so much Windsor - from the engagement photo to the wedding planning. 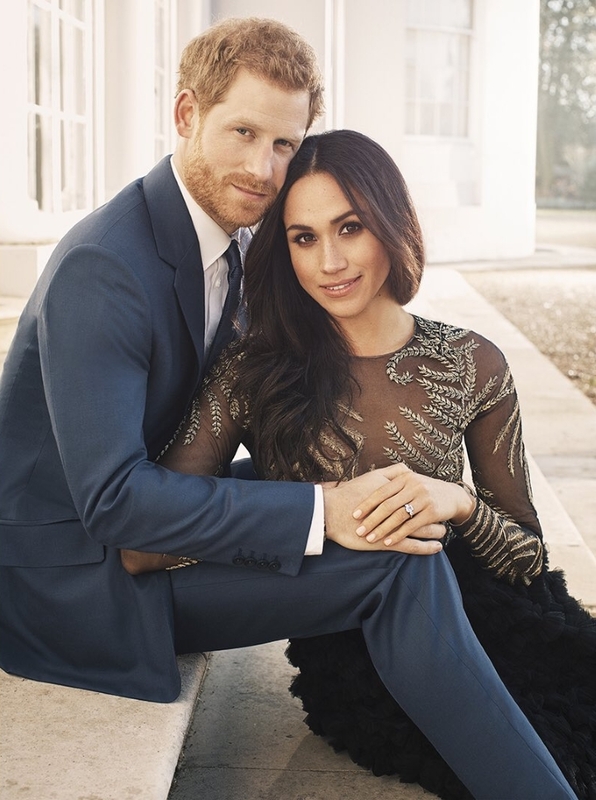 It was their engagement photos and settings which even had me guess more about Windsor as possible title. Fantastic recap and what a great way to build excitement for their big day! Thank you for the time and effort it took to write such an informative article, Charlotte. Brilliant!! A definitive piece, a million thanks for doing all this!! I see this blog title making a great book title! Wonderful summary. Thank you Charlotte for your great job. Reading it is a very nice way to spend the time that separates us from the great event. Brava! Sorry if it’s been mentioned! Did anyone watch Meghan Markle: An American Princess? Did anyone else think it was in terribly poor taste for her sister to basically say “you’re super rich now, help me and give me money for my medical needs”....?!??!! Holy MOLY!!! My jaw dropped!!! I hope she avoids those type of people now. Just be happy and in love, follow dreams, travel for the greater good, and spread love and hope! :)) I was a bit skeptical of this relationship at first but she has definitely grown on me! Courtney Providence Village, I watched that program. It was rather an interesting perspective on different facets. I did learn some new things such as I found out there is a silent s in Viscount coming from the American who married into royality. She had quite the learning curve. They sure did interview quite a few people for this one. And there are more specials coming which we knew would happen as the day draws nigh. I didntbsee it but i think it's in incredibly poor taste for that side of the damily to do what they are doing. Now her sister has dyed her hair (to look more like meghan? No idea.) And her father has apparently been working with a photographer. The photos of him being measured? Fake. The guy measuring wasn't a tailor. In defense of Mr. Markle, I think he lives in extremely reduced circumstances. No one retires to a crime ridden town in Mexico for any other reason. I doubt his reasons behind these photos were to exploit his daughter. Basically, they are innocuous and only an embarrassment to him. My guess is he desparately needed the money for the wedding such as to get to London, pay for his own meals, buy a few rounds of drinks, get some nicer clothes and prchase a wedding gift etc. I have a great deal of sympathy for this man. He will be completely out of his element in London and, perhaps, in the only way he could, tried to obtain a little more dignity to get through the whole process. IF this latest news about dear old dad is true, then I think it's the ultimate betrayal and if I were his daughter I would tell him to not bother boarding the plane; I have it covered. And mom, make sure those shoes are comfortable being we're doing this together!! Kate, I think your take is compassionate and correct. Not only reduced circumstances but frankly I have always wondered what other issues he has dealt with for most of his adult life. Something really changed for him. Kate, finances don't excuse what he did. Allegedly. How about a heart to heart chat about the reality of his position? I very much doubt that Meghan would not step up and would allow herself to be embarrassed because he is not wealthy . Rosarita Beach is a resort town south of San Diego. It's not a crime ridden town at all. I imagine parts of it are, just like many towns and cities, but it's not a poverty stricken slum. A lot of American retirees live down there. And I've been there before it got as gentrified as it's got today. I doubt that his daughter isn't paying his way over, or providing accommodation and meals. She apparently has helped him over the years by paying some of his bills as well so I'd be stunned if she wasn't helping him get over to Britain for the wedding. No, he took $100K to have staged photos taken. Photo reading guide book? Check. Photo looking at a website about his daughter and her fiance?? Check. Photo of delivering flowers to his ex wife's house? Check. Photo of him being measured by a party store employee? Check. $100,000 while his daughter's fiance was having his press office plead for his privacy. No, I feel no sympathy at all. Matter of fact, I was just having tea with the dowager, as we do every Sunday, and told her about this. My dad loved money, she knows that better than anyone. But she said he would never have done something like this to me or my sister. He might have loved money, but he loved us more. The dowager looked at me and said, "I know what you'd do. He wouldn't walk you down the aisle". I said, no, he wouldn't. And it would take me a long time to forgive him for it. I have to step back on my comment about him being paid $100K. I have since found that the syndication rights might have been worth that much, not that was his payment. I'd be surprised to discover he wasn't compensated at all, though. 🌸 Plus, I think, Kate, that Thomas, Sr. may be in the circumstances that he is in because he no doubt has helped his daughter because she has medical needs. I think that that might be where the bulk of his monies go. Take note of the date. Royalfan and I are in agreement on something. That was cringe worthy, and unexpected. He had done much for the off spring, stayed out of controversy, and happened to have done the unexpected in April, which was posted a week before the wedding. It can be interpreted in different ways. I felt some gloom and sadness, and got upset with myself to feel this way. Then I realized, distance from the family’s affair over all is better for someone who doesn’t know them closely and does not know why they do the things they do. There may not be such a thing as the perfect family, but it hurts more when the disappointment is caused by family members than even best friends. May be he did it so the paparazzi will leave him alone. It is doubtful proper consultation had been done with Doria, or his daughter. What is interesting and comforting is as the family’s theater goes on in public, the couple seems solid, in a well-organized and joyful wedding planning, and keeps releasing hopeful news towards their happy day. The “end” to the parallel universe is closing out; by next Saturday, they will live the following. Genesis 2:25 “Therefore, a man shall leave his father and his mother and hold fast to his wife, and they shall become one flesh.” The same goes for Meghan; She will leave her family and hold on to her husband. As they said in their engagement interview, “We focused on us”. I hope they will find happiness as each other’s foundation for a long marriage. Her parents will always be her parents with good and bad like any other human beings. Bluhare, Rosarita is not what it used to be. Drug related crime and gang war activity has spilled into the border community. Homicide rates continue to climb and American tourism is way down due to crimes against them specifically. Mr. Markle's adopted hometown is no longer the paradise of even 10 years ago but it does offer the numerous expats a lifestyle they would not be able to afford in expensive sunny Ca. Royalfan, maybe he has had that conversation with Meghan or maybe he is a proud man. I don't know. None of us know. I just know that life isn't so cut and dry, and without that knowledge we shouldn't be passing judgement. Life is difficult and people struggle in many ways. I agree with ali that it seems Mr. Markle appears not to be the man he used to be for whatever reasons and, maybe, we should be cutting him some slack instead of quickly condemning him. Ali and surfer girl, I agree with both of you. Also, to keep things in perspective, Mr. Markle hasn't spoken with the press in any negative way regarding Meghan and the pictures are harmless really, just silly. Does Mexico has an extradition agreement with USA? Does the UK? Could a special temporary, limited exception be made for a royal in-law? That information could add a few pieces to the puzzle that has been MM's father. 🌸 I am excited to see what Doria will be wearing and to find out if Thomas, Sr. or Doria do a short speech/toast at the reception. It all must seem very surreal to Doria and Thomas, Sr. Again, I hope, since Thomas, Sr. is retired, that he can stay in England for awhile and sightsee as he seems interested in that. Do you really think we will get to know about the possible speeches of her parents? The press won't cover the reception as far as I know. 🌸 Thanks for the Genesis 2:25 reference, Anon 15. It helps keep things in perspective. 🌸 or that Royal woman that wore that detestable brooch. Wow Charlotte what an absolutely beautiful and well thought out summary. I loved every bit!!! I am certain Meghan is going to be very good for the monarchy and likely vice versa. I am a bit embarrassed for her by the antics of her family and it is crystal clear why she sidestepped them. Cannot wait for Saturday!! Charlotte, you don’t have to post this but I wanted to let you know it makes me really uncomfortable when details are written like “crying tears of joy” when she tried on her dress. It’s a nice image but if she didn’t actually do it then we are making up a fake story about her and that’s wrong. It discredits all the real facts and information you put so much work into presenting. I love all your work and love this blog. I wanted to say a heartfelt thank you for the very kind comments on this post, it's one of the first feature pieces I've written here and the feedback is so greatly appreciated. The "tears" part bothered me too. Especially because no source was cited. At first, I didn't want to read the rest of the story but after scrolling down I realized it continued quite differently. Nice summary, must have been a lot of work. Thank you! When I read those words in the first sentence of this piece, I assumed Charlotte had a credible source. I know she never has and never would write anything that she didn't know to be true. Thanks, Charlotte for posting my question and replying. So glad there was a source. Maybe add a source in brackets or as part of the sentence or somewhere just so it’s known? Knowing there was a source, your reply, made me feel so much better and now I want to read the whole post. I’m a longtime reader and occasional commenter and just love what you are doing here. I am so delighted to see the announcement from Kensington Palace that our Presiding Bishop, the Most Reverend Michael Curry, has been asked to speak at the wedding. He is head of the Episcopal Church in the United States. He’s one of the most joyful and loving servants of Christ I’ve ever heard. Well done, Harry and Meghan! I am speculating that the rumored engagement the week following the wedding is a BP garden party. How satisfying for Harry at last to have his mate by his side. Or perhaps the engagement has already been announced and is a charity event. Apparently, just one post-nuptial engagement is planned before the honeymoon. Perhaps the wedding trip will be in two installments, as with Charles and Diana. There is no more yacht Britannia, but a short respite to Scotland could be in order before the heavy royal calendar in June. KP Twitter has announced the cleric who will give the message for the ceremony. Interesting choice. All the news rushing out now is so interesting, and it serves to drown out the sad missives from the half-siblings. Bishop Curry sounds like a wonderful addition to the ceremony!! I wonder if he was recommended by the Obamas? And the very pretty and traditional consent proclamation---wonder if the design with the American rose and the California flowers will resemble a crest for MM? And I also can't wait to see Doria---I'm sure MM picked something gorgeous for her! And I do love the large tilty hats as well as the hats that Kate wears---with lots of folded material, so I'm looking forward to see how the US guests cope with their head wear. So much happening every day. As the mother of four, I will say "thank you," Surfer Girl! Are you a mother as well? I very much hope both parents gain economic independence through Meghan’s uber, uber good fortune and I think they will accomplish that wisely. They have now seen uber wealth and privilege up close and personal on a level, that in scope, is unimaginable to the average person. So in gaining financial independence, they can more conveniently be part of Meghan’s life, traveling when they want, to visit and to bless their grandchildren with adventures and gifts, staying for visits longer. They could better afford security measures for themselves if need be to keep the media, etc., at bay. Both parents will end up, sooner than later, in England. I truly believe that. Sophie even had her father live with them in that huge estate she and Edward have. Given Thomas, Sr.’s position now, and his new celebrity, it may not be advantageous for him to remain in Rosarita given the statistics there. I think that Thomas, Sr. and Doria will each be given their own homes but within one of the secure Royal properties, or reasonable facsimile. Meghan (and Harry) could easily make that happen. It may not be realistic for Doria to remain comfortably and safely in her suburban home either. I believe that Thomas, Sr. has had depleted funds because he has no doubt been helping his other daughter who has medical needs. Happy Mothers Day to you, Pam and all the mothers. surfer girl: Omid Scobie, a VERY reliable source for information so far, has stated on his twitter account that MULTIPLE sources have confirmed that Doria HASN´T met Oprah and will do NOTHING media-related, money-earning interview etc. As far as her father is concerned, well, I´ve said it numerous times, there is a REASON for not having met your future father-in-law until just a few days before the wedding. If your fiancée had a loving, functional relationship with him, you WOULD have met him WELL before the engagement. Simply because it´s the most natural thing to do. And it doesn´t matter whether you are a "reclusive" or whatever. Your love for your daughter would be greater than any "angst" you might have. Eve, the reason for Harry having not met Mr. Markle may be as simple as that the man is a recluse. I'm suspecting he is making a huge personal effort just to attend the wedding. Also, perhaps, her strained relationships with her half siblings has strained that with her father as well. He is their father after all too. Why assume that the reason is due to a deficit in Mr. Markle? Thank you Charlotte! You did wonderful, outstanding work on this summary. While I believe everyone’s life changes at after a wedding, Miss Meghan is truly saying good bye to a whole lifestyle to exchange it for a new one. She will indeed use her platform as Prince Harry has done. Diana is looking down from heaven , so proud of her son. I hope Becca at least has time to read these posts---if not, she'll have some catching-up to do after her assignment in Canada!! Wherever that production studio is, Becca. Charlotte, I sincerely hope that Meghan sees this post. You did an amazing job. Pam from Boston, I was thinking about this story and going through the possible reasons for it. The father has not said anything about MM to the press so he may feel that he is being clever and making money this way. Possibly he does not want to ask MM for money to go to London and thinks this is better. His loose ethics may be why he and Doria are not together. :) I'm afraid he gave away his respect and I do feel sorry for MM now, having to introduce him to her in-laws with this situation. But at least he didn't sell words about his daughter---just stupid fake setup scenarios, if true, and it makes sense that it is true. Terrific and insightful background piece on Meghan. I really enjoyed reading it. I believe she is a great asset to the Royal Family, and that she and Harry will pave their own remarkable path in the decades to come. Just loved this post and the NYT's article that you linked to in the post this am (Sunday). Thank you, Charlotte! I don't believe there are many globally, that aren't moved in a good way about Prince Harry & Megan Markle's upcoming nuptials. Magic. Romance. It's a fairy story really. And very evident they are well suited. And their role in The Royal Family is terribly exciting. The Queen must be equally proud & content. When I first read about Megan’s fathers photo stunts I felt a bit let down on behalf of Meghan. No doubt this wedding has imposed expenses that he could hardly meet. However, on second thought, he did not give an interview, and it involved no one but himself. And I’m starting to see a bit of humour in the whole thing. Peter Phillips sold his wedding photos, which I think was appalling, because it involved others. I’m not going to believe the story of the the Oprah interview until I see it. Such a lovely post, Charlotte - thank you so much. Whew! She really DID hit the ground running. It’s wonderful that she and Prince Harry found each other and that the Royal Family has recognized that she really is an extraordinary person and is treating her as such! More and more power to them both - and God keep them safe while they exercise it! 🌸 I watched the Lifetime movie last night. No offense to anyone but I did not like the movie at all. And I don’t think it portrayed Meghan accurately one bit and in addition to that there was nothing else I liked about the movie. No offense to those who may like the movie. I am really impressed by your post. So many info! It is an exhaustive overview of this Duchess to be. And thanks for your great work to inform us. Thank you, Charlotte, for your rigorous research and beautifully written piece. I'm delighted that you have taken such an explicit line in defending Meghan against her detractors, but more importantly, by drawing attention to her professional, personal, and charitable achievements prior to her engagement. You highlight her limitless potential for her future work, and no doubt she will accomplish much! You have covered Miss Meghan Markle from day one with such fairness and class. It is s a pleasure to read your posts. Thank you for all you do and the time you take to put together these posts. I cannot wait to read your posts once they are married. Be well and much success to you and yours.